I've been trying to avoid buying anything I don't need but I had to give in this past Tuesday when Smashbox had their "Create your own Kit" offer again. The last few times they had the offer, they didn't include the blushes so I had to jump on this deal. Basically, you get a gold bag and are allowed to add any three items (Eye Shadow Trio, Blush Rush, or Lip Enhancing Gloss) for just $39 which is a HUGE discount considering how much the products cost when sold separately. 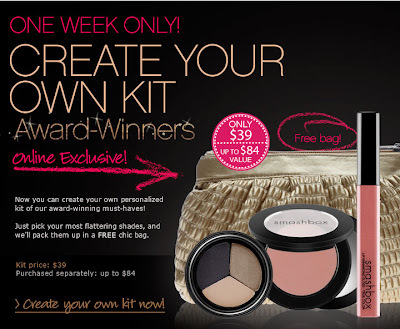 Individually, the Eye Shadow Trio is $28, Blush Rush is $24, and Lip Enhancing Gloss is $18. I ended up getting three Blush Rushes in Gingersnap, Paradise, and Heartbreak. A really long time ago, I bought one of these kits (there were only $33 then!!) and got Gingersnap, Paradise, and Chiffon. I loved Paradise but lost it and gave Gingersnap and Chiffon away. I always regretted giving Gingersnap away too since it's a lovely shade (especially for Fall) so I'm really happy to be able to have Gingersnap and Paradise again -and for only $13 a piece! 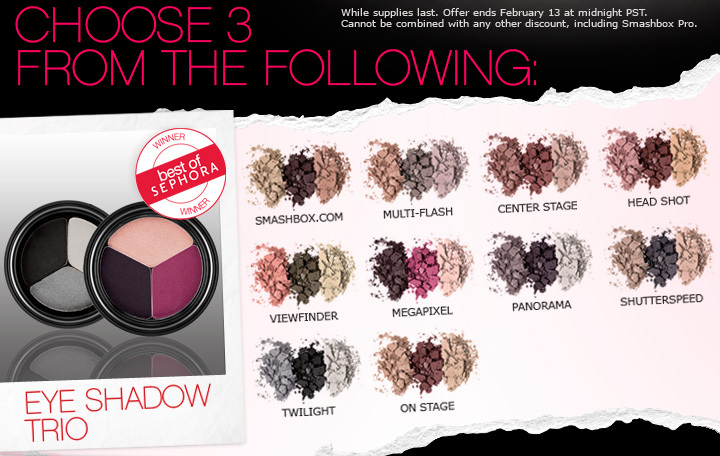 I got all of the above and my three blushes ($24 each when sold separately) for just $39 plus tax. If you purchase anything on Smashbox, I highly recommend placing your orders on Tuesday or Thursday mornings to get in on their Let's Do Lunch offers. They automatically add a free product if you checkout between 9 a.m. to 2 p.m. PST. Unfortunately, my free gift (a berry colored lip gloss for Tuesday) was taken out since they don't allow multiple promotions at once (I used they promo code.) But I'm just happy they gave me all those other goodies.. I love Smashbox products and I highly recommend the brand. I don't think I've ever encountered anything that's been horrible -all of my Smashbox products are either good, very good, or excellent. Have fun ordering if you do! Do you like Smashbox products? What are your favorites? P.S. I also wanted to apologize if I haven't gotten back to any of your comments in past posts. I've always tried to answer every person's comment but over the last few months since Decemeber, I've gotten really busy! Thank you for all the support through all the ups and downs during the last few months. I truly appreciate every one who's stuck by me and I really appreciate all of your kind words and support. I love your post. You always find the best deals and always share to your followers! :) It is much appreciated and if I could spend money on makeup I would definately get this. 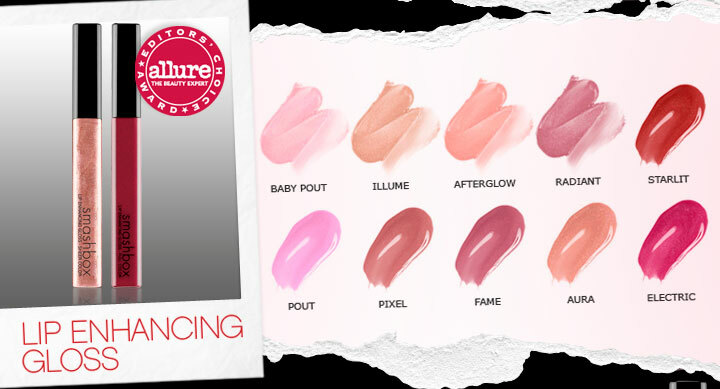 I LOVE the blush in Chiffon...it's amazing!!! I got it as part of the 3 for $33 last year! You and your amazing blog will be the death of me! Headed over to smashbox site now! Such an awesome deal..I'm glad this is a US promo b/c I really don't want to spend the $ right now. I love their eyeshadow trio in Multi-flash, not only did I hit pan on that I pretty much emptied it out! @ Christine.. It is! Love Smashbox..
@ PoorCollegeStudent.. LOL! Make sure you sign up and become a member to get your points and free gift. =) Let me know what you get! @ Tracy D.. I'm trying not to spend too but couldn't help it since I've been waiting for this deal to come along again. =O I love their eyeshadows too. Multi-Flash looks gorgeous! I wanted to get a trio but couldn't choose so I just got another blush instead. I love Smashbox. My current favorites are the Healty FX foundation and the Artificial lights highlighter. I love all those deals you get, problem is being in Canada, the shipping is very high online so I never order anything from Smashbox. I made my first order (first Smashbox too!) after reading this post. haha. Really want to try some Smashbox stuff but it's quite difficult to get hold of in the UK. Everytime I read your blog, I get inspired to search for any good deals that's out there. Haven't managed your 66cent blush steal though! I really like your indepth reviews but still want more regular posts, so perhaps rotate between the two? Do detailed reviews of stuff you think are spectatular wins or fails, whilst faster comments on the neh-ok things. What do you think?